A-1 Express Rental's Canopy Rental is a lightweight pole supported covering, offering economical shelter from sun and light rain. Customers can easily install these canopies on any flat grassy surface using easy to follow written instructions included with the rental Give A-1 Express Rental a call if you have any questions about our DIY Canopy rental. Available in 20' x 20' through 20' x 30'--sidewalls are not included. Tent rentals made easy! 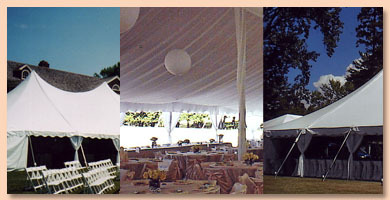 A-1 Express offers a variety of tent rentals for any occiasion. A heavy duty center pole supported design, with wooden side poles. Prices include installation and removal, but not the delivery, colors may vary. Please call for tent rental pricing. These need to be installed by A-1 personnel only. If you're planning an outdoor wedding or celebration, look no further for tent rentals! A heavy duty center pole supported design, with wooden side poles. Defined with graceful peaks that offer the popular and dramatic curve and peak look. Beautiful for any special occasion. Prices include insallation and delivery, available in white. These need to be installed by A-1 personnel only. Please call for tent and delivery prices.